Yggdrasil Gaming, a Cherry AB (publ) – STO: CHER-B.ST – subsidiary, is set to revolutionise the table games sector when it launches high-tech versions of the classic table games Blackjack, Roulette and Baccarat. 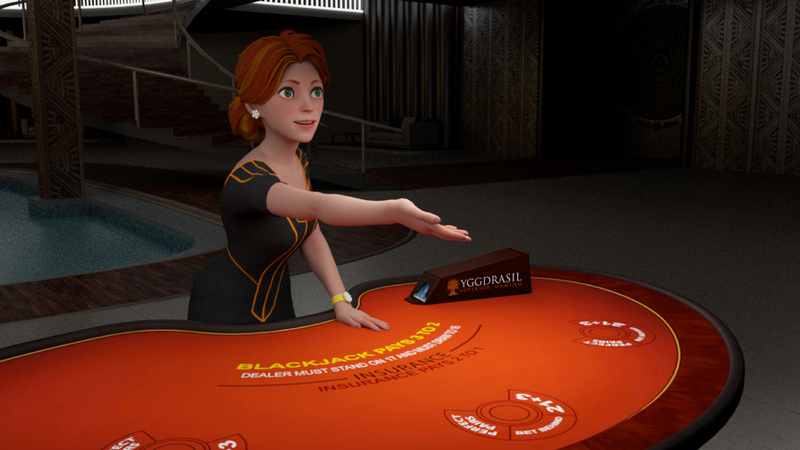 The player will be fully immersed in a 3D casino environment and be able to interact with a digital dealer, which will enhance the experience. Yggdrasil is developing several popular multiplayer table games, with Blackjack the first to go live, using the company’s progressive, in-house technology REDUX™. The product will also include popular sidebets and a range of powers unique to each dealer. REDUX™ combines the best aspects of both live and RNG (Random Number Generation) casino, providing the perfect platform for players to fully immerse themselves in a 3D casino environment, which uses motion capture technology to model the movements of the dealer. To enhance the experience, several different, high-quality dealer characters are being developed using the technology, and each will be programmed with detailed hand movements and facial expressions to interact and communicate with the player. Alongside a standard branding package, there will also be the option for exclusive, customised tables and dealers. Operators will be able to dress up the game according to their visual identity or special themes. Following the initial launch of Blackjack, Roulette and Baccarat will then be added to the portfolio of table games, all utilising a highly-detailed 3D dealer and innovative social experiences, which will allow players to sit and communicate with other players at the gaming table. Yggdrasil table games will initially go live with operators Vera&John and Intercasino, both part of the Jackpotjoy Group, in a beta partnership with a view to being fully operational later this year. “Our table games provision, starting with Blackjack, is set to break new ground in online casino gaming. The table games vertical has been fairly static in recent years. But our product’s combination of social interaction and high-end playability is unlike any other currently on the market. Yggdrasil’s table games will complement its expansive product range, which has recently seen the addition of bingo to complement its extensive collection of slots titles and support the company’s strong market position. Further details are available in the press release published on www.yggdrasil.com and on www.yggdrasiltablegames.com. The first table game will be demonstrated at ICE Totally Gaming in February 6-8 in London at the Yggdrasil stand N3-140. This information was submitted for publication on 10 January 2018, at 10:00 a.m. CET. Cherry is a Swedish innovating and fast-growing gaming company established in 1963. The business strategy is to create shareholder value by owning and developing fast growing and profitable businesses within the gaming and casino industry. Today, Cherry operates through five diversified business areas: Online Gaming, Game Development, Online Marketing, Gaming Technology, and Restaurant Casino. The objective is to grow organically in combination with strategic acquisitions of fast-growing companies. Cherry employs some 1,100 people and has about 6,900 shareholders. The company’s class B share is listed on the Nasdaq Stockholm exchange, Mid Cap segment. More information is available at www.cherry.se.